Local author Ms. Angela Burnette has donated over 250 copies of her book ‘The Irma Diaries’ to schools across the Territory as part of her ‘Read to Heal School Programme’. Ms. Burnette has partnered with various businesses from the private sector and officially launched the programme at the Alexandrina Maduro Primary School. Minister for Education and Culture Honourable Myron V. Walwyn who was present during the event highlighted the importance of food security and encouraged the students to be active in their school garden programmes. 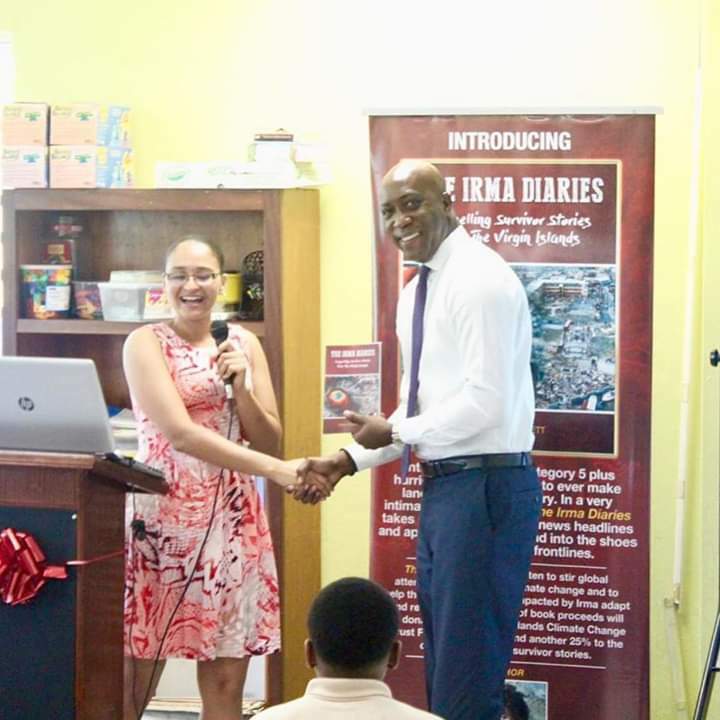 Ms. Burnett in her remarks explained that the programme is designed to bring the book into schools to share its important life lessons, help heal the lingering trauma from hurricane Irma and educate students about climate change in a very personal way. Ms. Burnett looks forward to seeing the book forming part of the formal school curriculum so that this important part of the Virgin Island’s history and its lessons could be preserved through the generations. Virgin Islands School of Technical Studies student Kais Masson read an excerpt from Mr. Albert Wheatley’s survivor story captured in the book. Mr. Wheatley’s story stressed the importance of building more resiliently for the stronger hurricanes that will be experienced as a result of climate change. Persons interested in volunteering to read and host discussions with students under ‘Read to Heal’ can sign up through The Irma Diaries’ website: www.TheIrmaDiaries.com.